Our friend Greg from ‘Life’s A Picnic” is a blogger, professional photographer and World Class Ocean Liner Voyager’. 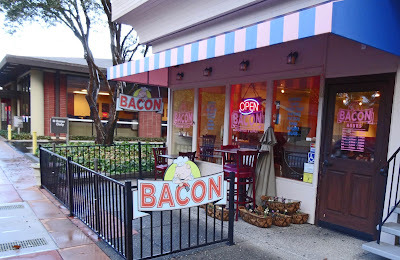 Greg, who lives in Marin County the home of all things politically correct and possibly the only place that tye dye is still fashionable, told me about a new breakfast spot in Novato called ‘Bacon”. He definitely knows what catches my attention. We loaded up the Racing Honda on this rainy Sunday and headed to our breakfast destination; Bacon. Downtown Novato was almost deserted this early Sunday morning. We found a spot right in front. We also seemed to be the first customers at 7;30am even though the place had been open for an hour. We were greeted by the owner’s wife immediately. Strong black and great tasting coffee was served to prepare us for the food to come. Eggs benedict for Ms. Goofy and buttermilk pancakes for me was our choices. Where is the bacon you may ask? There was an item called ‘Millionaire’s Bacon’ on the menu. Of course this signature item had to be explored. Let’s begin with the good. Our meals were picture postcard yummy looking. The Millionaire’s bacon was the highlight of our meal. This is smoked bacon that has been baked for 4 hours in a low oven and coated with brown sugar and salt. It is served warm with a drizzle of maple syrup. This bacon was fabulous. 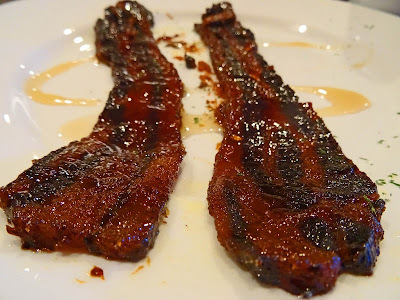 It was chewy, sweet, smoky and possibly a religious bacon experience. Homerun! Ms. Goofy thought her eggs benedict was decent but thought the eggs were a little over done. My pancakes were like little hockey pucks and needed a serrated knife to cut them. They were not piping hot so the wrapped butter pats did not melt over the cakes. We will award bonus points for real maple syrup. 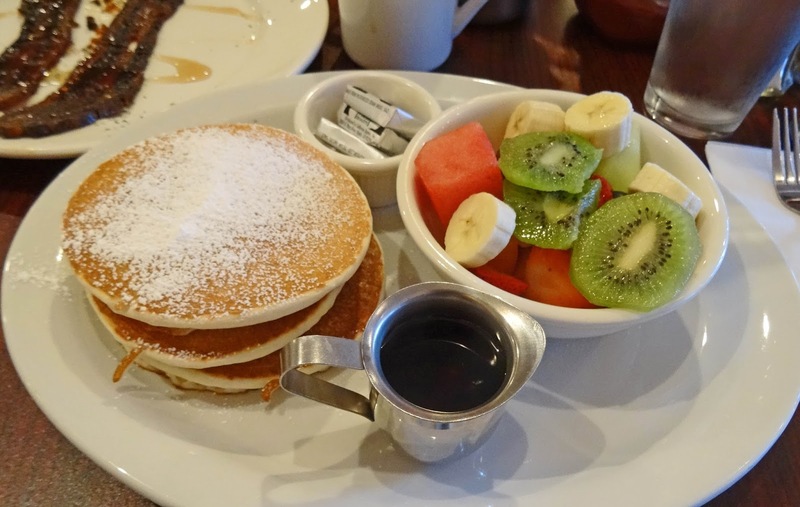 I did enjoy the festive looking fruit cup that accompanied my pancakes. 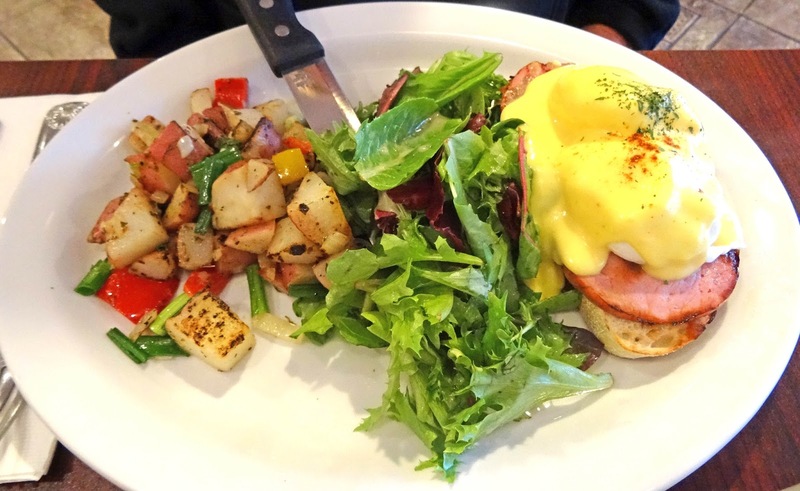 Great coffee, service and some fantastic ‘Millionaires’ bacon made this breakfast decent. Ms. Goofy enjoyed her eggs benedict but was a little disappointed in the eggs. She did mention that she was enjoying the garlic after effect (burp) from the home fried potatoes. My pancakes were a fail. We were glad to experience the restaurant ‘Bacon” but will probably not return. At least the bacon was good. It's hard to screw up pancakes. Big Dudes, I would of been more forgiving if at least they were warm enough to melt the butter pats. You know butter pats is another pet(pat) peeve of mine. I understand why restaurants use them but it just seems to cheapen the experience.